Princess Elizabeth Plantagenet is my 21st great-grandmother and daughter of King Edward I of England. Edward, son of King Henry III, was born at Westminster in June of 1239. At the age of 15 he was sent to Spain to marry the 9-year-old Infanta Leonor (called Eleanor in English) of Castile. King Henry III died in 1272 and Edward ascended to the throne of England. Edward was devoted to his Spanish wife, and they had a total of sixteen children. Elizabeth was the youngest daughter and second to last child, with her younger brother Edward being the youngest. Edward, who would succeed his father as King, and Elizabeth were only two years apart in age and reportedly quite close throughout their lives. Elizabeth was also a favorite of her father's and he spoiled her, much to the vexation of her mother Queen Eleanor. King Edward had been given lands in Wales at his marriage, and after he became King he continued to subdue both the Welsh and the Scots to expand his authority into their realms. He was quite successful at this endeavor, and brought much of Wales and Scotland into the fold of the English crown. Both Elizabeth and the future King Edward II were born during campaigns in Wales, and Edward II was the first to be styled “Prince of Wales”in the hope that it would endear the English to the Welsh people. This title has since been conferred upon each heir to the British throne. 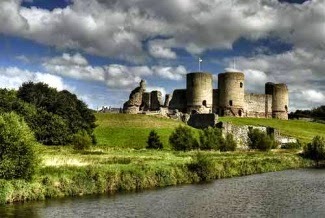 Elizabeth was born in the newly rebuilt Rhuddlan castle which sits upon a hill in the North Wales countryside alongside a man-made canal, created by diverting the River Clwyd. The rebuilding of the more ancient structure had been completed just months prior to the birth of Elizabeth which took place in the castle on 7 August 1282. By the spring of 1285, negotiations were underway for the betrothal of three-year-old Elizabeth with Johann (John) I, count of Holland who was two years her junior. Little John was then sent to England to be raised and educated at court. He married Princess Elizabeth on 7 January 1297 when he was thirteen years of age and Elizabeth fifteen. Soon after, he was permitted to return to Holland, but Elizabeth did not wish to leave England and he went alone. It's interesting to wonder how much, if any at all, the two felt for one another. However, she did join him there the following year. The marriage was to be short-lived, as John died of dysentery in November of 1299 at the age of fifteen years. No children were born of this marriage, and Elizabeth returned to England. There she met her new step mother, Margaret of France, whom her father had married during her time in Holland. Her own mother had died when Elizabeth was eight years of age. In 1302 Elizabeth, now 20 years of age, married for a second time to Humphrey de Bohun, first Earl of Hereford, at Westminster Abbey. This marriage would prove to be fruitful, as the couple had eleven children, seven of whom survived childhood. During Christmas 1315 Elizabeth was visited by her sister-in-law, Queen Isabella (of France) whom she entertained lavishly, though she was four months along in her 11th pregnancy. Perhaps she overtaxed herself, for when the baby was born in May, both mother and newborn child (named Isabel) died. Elizabeth was thirty-three years old. I am descended from both her daughter Lady Margaret, who married Hugh de Courtenay, Earl of Devon and her son William de Bohun, who became Earl of Northampton and married Lady Elizabeth de Badlesmere.